IN THE AMAZING SETTING OF THE HILLS AND GLENS OF DUNROBIN ON THE EAST COAST OF SUTHERLAND THE OPPORTUNITIES EXIST TO ENJOY THE EXPERIENCE OF DEER STALKING AND LOCH AND RIVER FISHING. Weekly (on occasion daily) packages are available for stalking over the lands of Dunrobin North and South. Details of how to get in touch with Dunrobin Sporting. 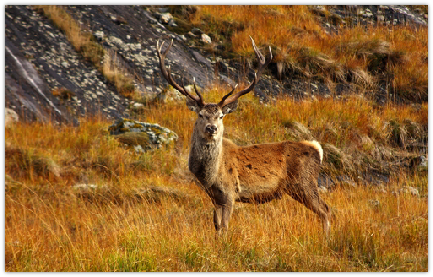 DEER STALKING IN SCOTLAND BASED AT DALREAVOCH LODGE -A WONDERFUL PLACE FOR A SPORTING HOLIDAY IN THE HIGHLANDS. The management of deer and fishing for sport and food is a very old tradition in Scotland going back centuries. Dunrobin Sporting works closely with Sutherland Estates in the management of the land and lochs around Dalreavoch Lodge to ensure the long term sustainability of deer and fish.